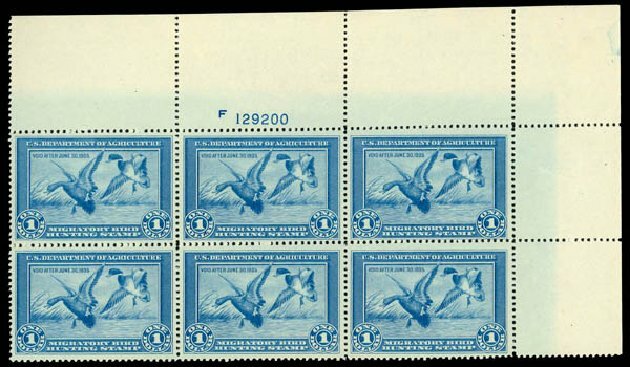 USA (Scott RW1) 1934 MALLARDS $1 BLUE Choice example of this issue, fresh, MINT never hinged, usual tiny gum skips, very fine. Cat $700. 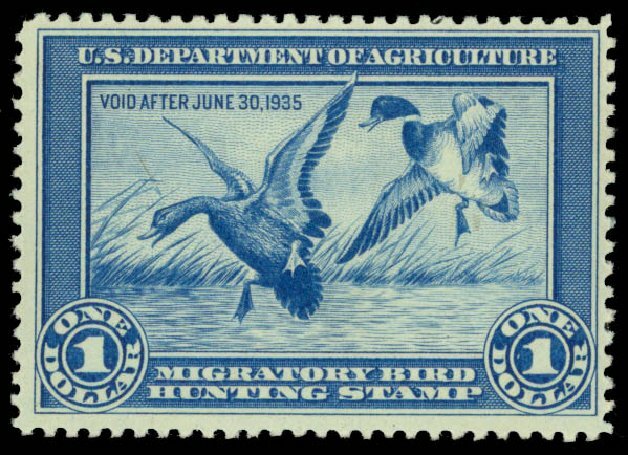 U.S.; Hunting Permit, 1934, $1 Mallards, #RW1, n.h., Very Fine. Scott $700. Estimate value $200-250. 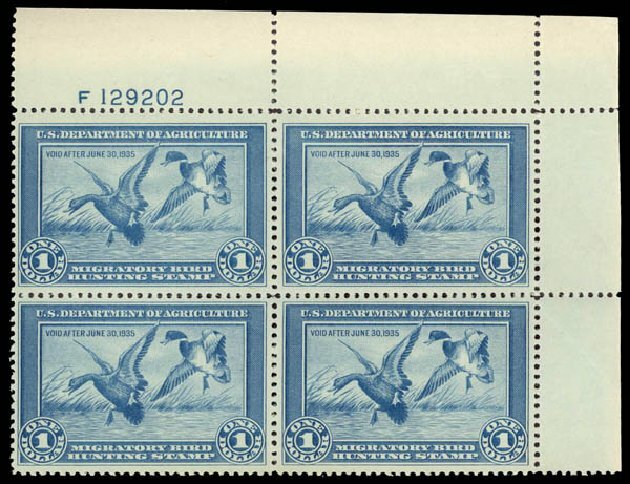 U.S.; Hunting Permit, 1934, $1 Mallards, #RW1, n.h., plate single, “tiny natural gum skips”, Grade 80J Very Fine, PSE (2014) cert. Scott $700+. Estimate $200-250. 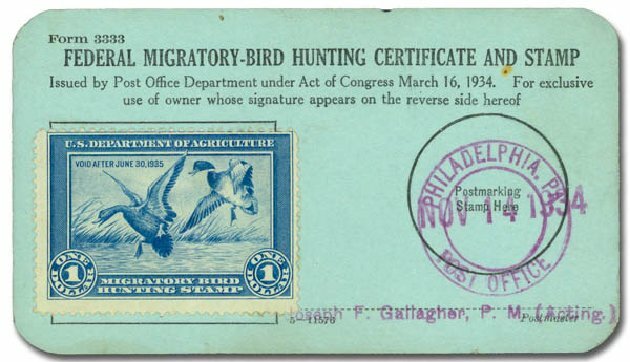 Hunting Permit, 1934, $1 Mallards (Scott RW1), uncanceled on Hunting License handstamped Philadelphia, Nov 14, 1934; stamp average centering, otherwise Very Fine. Estimate $150 – 200. 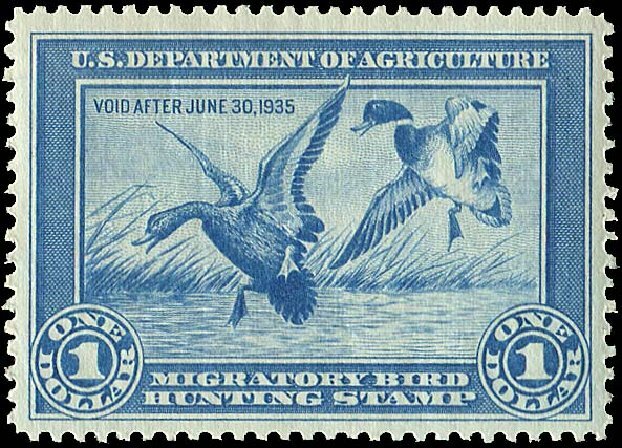 Hunting Permit, 1934, $1 Mallards (Scott RW1), o.g., never hinged, a lovely mint stamp in pristine condition, with fabulous deep rich color, Fine to Very Fine. Scott $700. Estimate value $300 – 400. 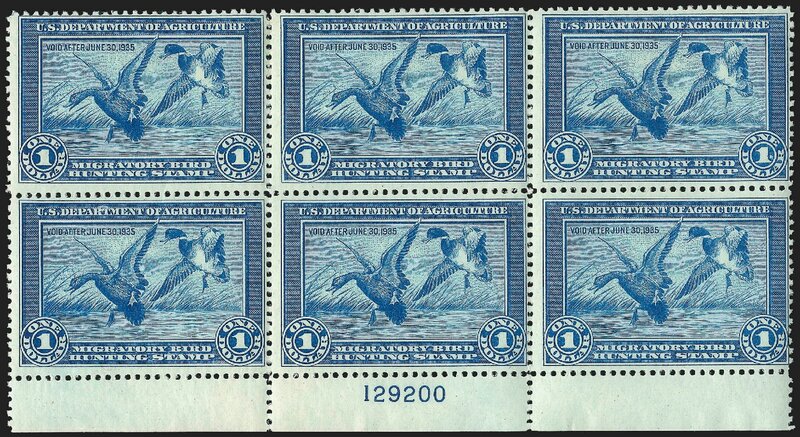 Hunting Permit, 1934, $1 Mallards (Scott RW1), top right block of 4 with plate number, o.g., never hinged (minor gum bends), extremelay handsome and desirable multiple with brilliant fresh color, choice well centered stamps in immaculate state of preservation, Very Fine. Scott $2,800 as singles. 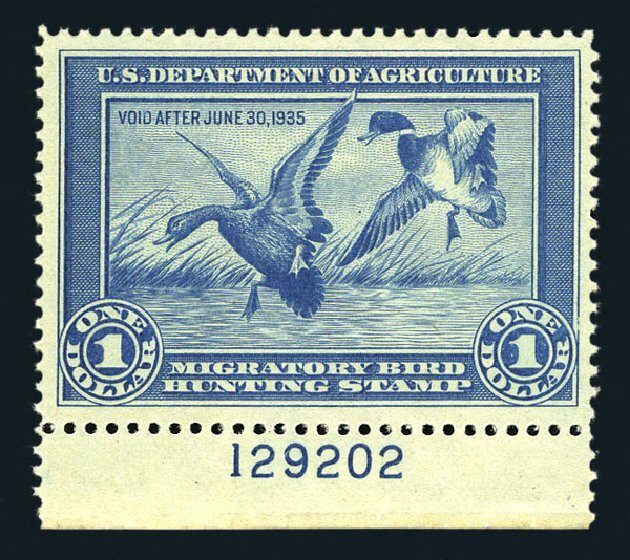 Estimate price $1,500 – 2,000. 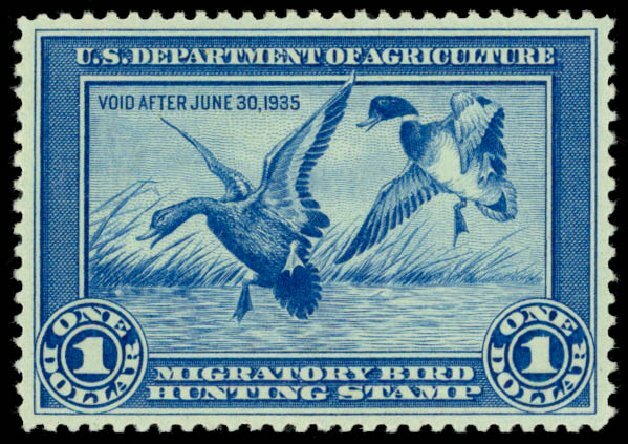 Hunting Permit, 1934, $1 Mallards (Scott RW1), top plate number single, o.g., never hinged, impressive example with captivating color and finely etched impression, a handsome position piece in pristine condition, Fine to Very Fine, 2014 P.S.E. certificate. Scott $700. Estimate price $400 – 600. 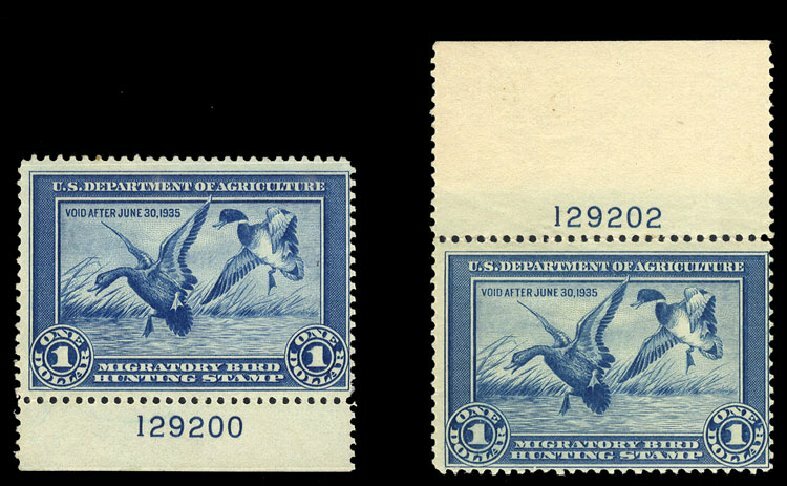 USA (Scott RW1) 1934 MALLARDS $1 BLUE Extremely fine, bright color, original gum, previously hinged. Cat value $375. 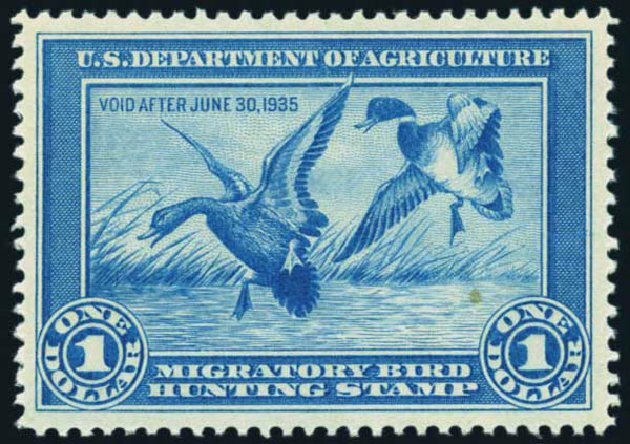 USA (Scott RW1) 1934 MALLARDS $1 BLUE (PSE GRADED 80 JUMBO) Stunning top margin plate single, #129199. 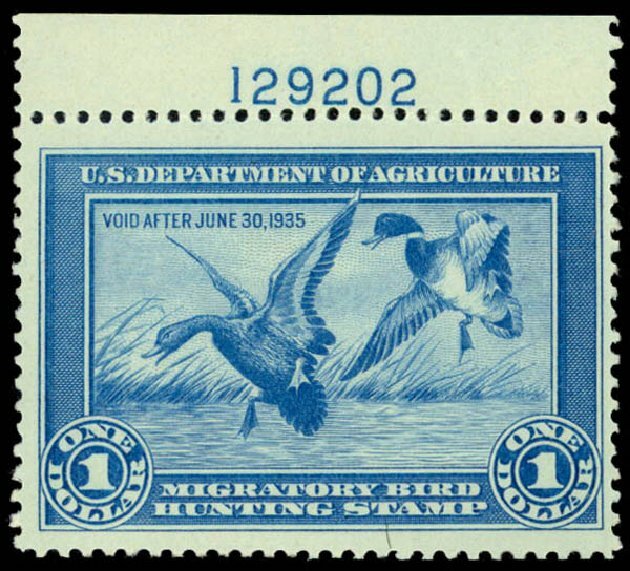 Big stamp, MINT never hinged (previously hinged in selvage only), very fine. (2012 Graded PSE Cert #01256888 VF 80J, Mint OGnh). SMQ 80 is $690, 85 is $825. 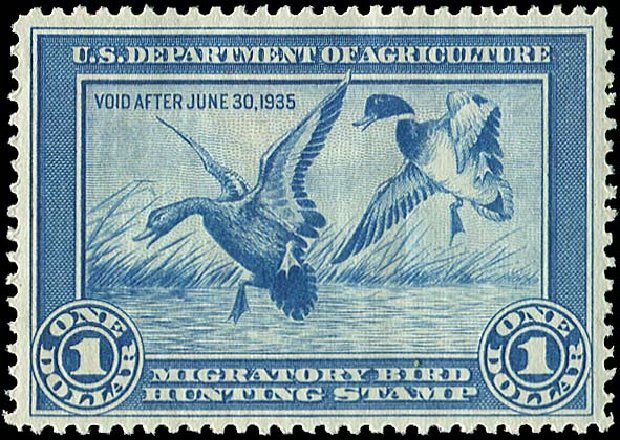 U.S.; Hunting Permit, 1934, $1 Mallards, #RW1. N.h., well centered good color, small spot, Very Fine. Scott $800. Estimate value $250. 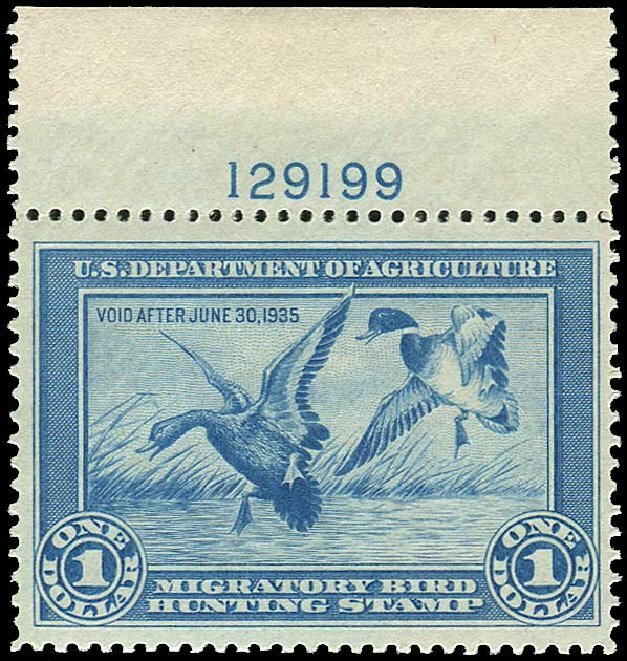 Hunting Permit, 1934, $1 Mallards (Scott RW1), top right plate block of 6, o.g., never hinged (minor gum skips), absolutely stunning top quality example of this rare and undervalued plate block, with impressive rich color printed on clean white paper, full wide selvage at top and right; this plate block is easily among the finest known is a remarkable state of preservation, Very Fine. Scott $16,500. 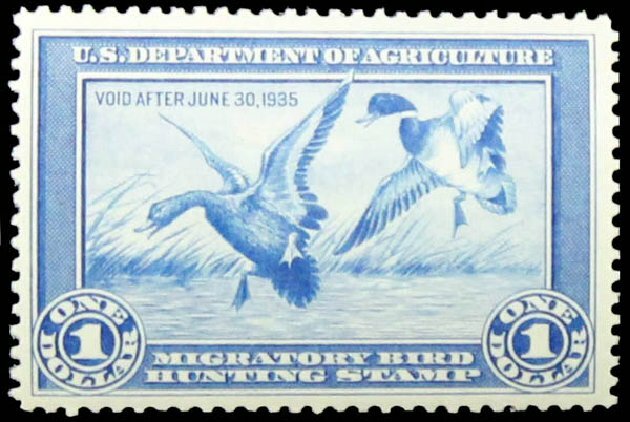 Estimate price $10,000 – 15,000. 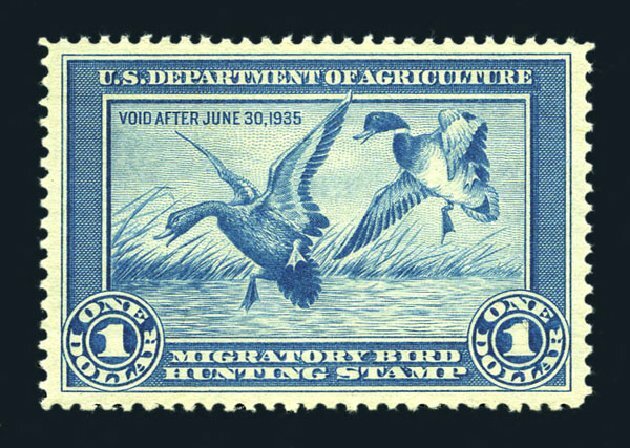 Hunting Permit, 1934, $1 Mallards (Scott RW1), o.g., never hinged, extremely fresh without the usual gum problems, an immaculate example, Very Fine to Extremely Fine. Scott $750. Estimate value $500 – 750.